Please confirm the brand “Artsbaba” and purchased from Xin Technology. Purchasing from other unauthorized sellers of this listing is under NO Warranty. Create your personalized unique doormat: First, please click the yellow button “Customize Now” on the right, customize the letter, your name, your text or your unique photo. 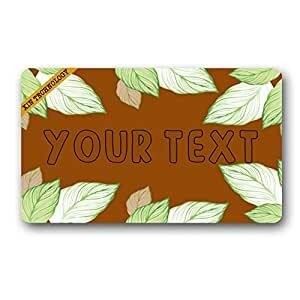 Second, input your text or letter and select your font color, then your personalized image will be generated. It is worth mentioning that the customized locations are set manually and there may be some deviations. So, we will make some adjustments for the font and location after you offered your monogram letter or text. Made of heat-resistant non-woven fabric and backed with a neoprene rubber backing. It is Machine-washable. Welcome! Xin Technology Inc. is a professional company specializing in the production of custom doormats, you can design a unique doormat by yourself. Our durable doormat is made of heat-resistant non-woven fabric and backed with a neoprene rubber. It can play a good non-slip effect with a strong friction. It is machine-washable and it can clean shoes and keep room clean. These doormats are perfect for bedroom, bathroom, kitchen and so on. Exquisite design makes your house warm and comfortable. And it is a perfect gift for someone you love. If anything at all goes wrong with your doormat, please feel free to contact us. Don’t hesitate, just take it home now!